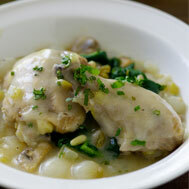 Here’s an exciting chicken recipe to serve for lunch or dinner. The tomato-bean salad offers a fantastic way to include lima beans in your diet. Lima beans a good source of fiber, which helps prevent spikes in blood sugar levels. Lima beans are also a good source of iron, providing almost 25% of the recommended daily amount per cup, along with about 15 grams of protein. Combine yogurt, ginger, curry powder and lime juice. Add chicken thighs and turn to coat with yogurt mixture. Allow to marinate in refrigerator 1 to 4 hours. In small saucepan, combine vinegar and water; add pickling spices, 1/8 teaspoon salt, sugar, red pepper flakes and celery seed. Bring to a boil, then lower heat and simmer for 5 minutes. Remove from heat and cool. 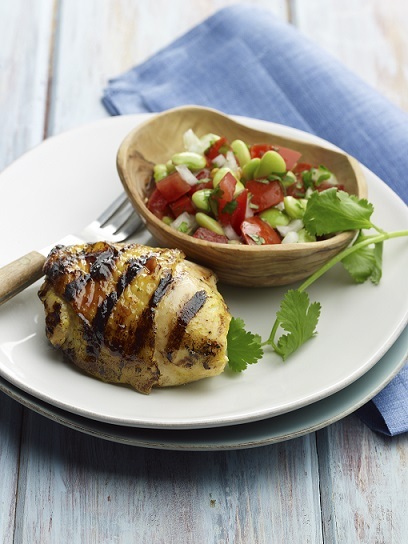 Remove chicken from marinade, draining excess, and discard remaining marinade. Season thighs on both sides with remaining teaspoon salt. Place chicken on grill or under broiler to sear. Turn over once until well browned, cooking for a total of 6-8 minutes. Continue to cook chicken, turning to avoid burning. Grill or broil chicken until it reaches an internal temperature of 170F, about another 15 to 20 minutes.